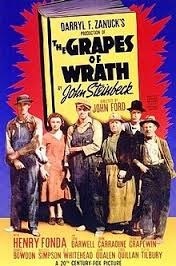 John Steinbeck was awarded the Pulitzer Prize for his novel The Grapes of Wrath On the 6 May 1940. It was published in 14 April 1939 and also won the annual National Book Award and was cited prominently when he won the Nobel Prize in 1962. Set during the Great Depression, the novel focuses on the Joads, a poor family of tenant farmers driven from their Oklahoma home by drought, economic hardship, and changes in financial and agricultural industries on their journey to find jobs, land, dignity and a future. One of the son’s Tom Joad is paroled from McAlester prison for homicide and while returning home near Sallisaw, Oklahoma, he meets An old friend named Casy. On reaching his Farm Home they find it, deserted and an old neighbor, Muley Graves, informs them that they are at Uncle John Joad’s home nearby because the banks have evicted all the farmers and repossessed the farms after the crops failed and they were unable to pay the bank back.